Belize, one of the countries that’s part of the Mundo Maya, has been enjoying a spike in tourism this year, with travelers flocking to experience firsthand the activities leading up to the end of the Maya long count calendar. Not surprisingly, prices for hotels and airfare have surged to meet the higher demand. But there are still deals to be had, including this one that recently hit my inbox: an impressive 45 percent off a fishing trip by Frontiers Travel at the Turneffe Flats Lodge, located on the Turneffe Atoll, the Caribbean’s largest and most diverse coral atoll. 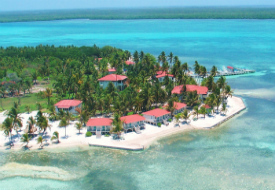 The reduced rate is $1,950 per person, which includes six nights’ accommodation, guided fishing and diving excursions, all meals (though not alcohol or, surprisingly, even soft drinks), Belize taxes, and transport to and from Belize City. You’ll have to act fast, as the first dates of the deal are July 21-28, but July 28-August 4 and August 4-11 are also up for grabs (but I did find some great fares out of New York, even in time for the first set of dates: around $550, increasing slightly for the next two sets of dates). I’ve not personally traveled with the Pennsylvania-based Frontiers Travel, but a quick online search of its Turneffe Flats property, which boasts eight air-conditioned guest rooms and two villas nestled in a pristine beachfront location, turned up plenty of positive guest reviews. And the photos look positively stunning. Each of the eight double beachfront guestrooms has air-conditioning, Mexican tile floors, and panoramic views. In addition, the two three-bedroom villas are well-suited for families or groups, bringing the total capacity of the property to just 28 guests. Guided fishing excursions take visitors through the angler's paradise packed with bonefish, permit, tarpon, and snook, as well as snapper, shark, barracuda, and jacks. Guests can also fish in the flats just a few steps from the lodge, where a reef draws more bounty of the ocean. The destination, while it takes a little extra effort to reach, also is a haven for divers. 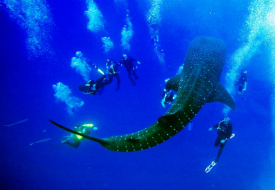 More than 60 diving sites are within easy reach, and just an hour away by boat is Lighthouse Atoll, home of the Blue Hole, one of the most coveted diving spots in the world, where whale sharks like the one at the right are common sights. Most dives are conducted from the lodge's 48-foot custom dive boat. To book the package, which is unadvertised on the Frontiers Travel website, call 1-800-245-1950, or email info@frontierstravel.com. To start planning your next trip, check out our Belize destination guide, and compare flight prices with our Travel Search tool.